Boa constrictors (Boa constrictor ssp.) 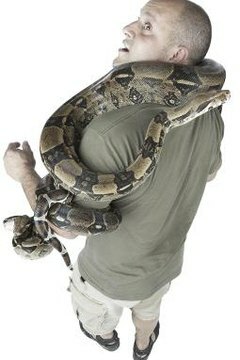 are historically popular pet snakes, but their immense size is a challenge for many keepers. The term “dwarf boa” is casually thrown about by breeders, dealers and hobbyists but, before selecting a new pet, be sure to understand the various snakes associated with the dwarf moniker. At least two races of common boa constrictor remain small, as well as several unrelated snakes called "dwarf boas." Occasionally, a population within a species is found in which the adults are much smaller than is typical for that species. Many times, these populations are found on islands. Hobbyists and breeders often rush to acquire these animals, and the term “dwarf” is quickly added to its name. Sometimes, this decreased size is due to genetic differences, but too often, it's an environmental effect that doesn’t persist in captivity. In these cases, once the “dwarf” specimens are maintained in captivity and provided with ample food, they attain the size of their larger relatives. Caulker Cay is a small barrier island off the coast of Belize that hosts a small population of boa constrictors. Caulker Cay boas (Boa constrictor imperator) are possibly the smallest race of common boa. Wild Caulker Cay boas share their habitat with very few prey species, and they subsist primarily on migrating birds that use the island as a temporary refuge. The maximum adult size for this species approaches 5 feet. Females can mature and breed much smaller than this, though; females are reportedly capable of breeding at 45 inches in length and 3 years of age. Hog Island boas (Boa constrictor imperator) are small boas found on a single island. Though not granted formal subspecific recognition, Hog Island boas differ markedly from the mainland boa constrictors. Clad in very light colors and with pale orange tails, Hog Island boas have color-changing capabilities and turn nearly white after dark. Hog Island boas may be extinct in the wild, but they're well represented in captive collections. Hog Island boas only attain 4 to 6 feet in length -- much smaller than the 6 to 10 feet that typical boa constrictors reach. A variety of other island boa populations are sometimes described as dwarf races. In many cases, this is wishful thinking, as even though wild examples remain below 6 feet in length, they have not been kept in captivity long enough to ensure they won't eventually reach large sizes on captive feeding regimens. Boas from Corn Island and Crawl Cay are sometimes described as dwarf species. What Is the Biggest Snake & Where Does It Live?